Last night I was reading an old copy of The Beano with my daughter in bed. She’s seven. The cover had Dennis the Menace and Barack Obama shooting people with a catapult in a storyline where Obama had hired Dennis to test his bodyguards to the limit. There’s a funny thing that happens between the ages of about four and seven. Kids learn how to forget things. You start to have to remind them of things that were very significant only recently. So even though I vividly recall my girl coming down the stairs on the morning Obama had been elected and sighing at the television, ‘Not Barack Obama again‘, last night she had to ask who he was. It’s hard to tell your child about injustice in the world. I never know when it’s a good time to bring it up. I don’t want her to know how horrible we can be. I don’t want her to be afraid that one day a government or a church might be horrible to her. But I also need her to know that there will always be people on her side. It was that reaction that I wanted to write about. I didn’t labour the point or give her a lecture about the current debate over marriage (we needed to get back to Dennis the Menace, after all) but although I wasn’t surprised that she had reacted in that way it did cause me to take a breath and realise something; this is the reaction of someone who has come to this discussion from another planet. It’s not like my daughter hasn’t noticed that Peterson and Glen are two boys and not a girl and a boy. It’s not like she hasn’t noticed that most couples she sees are male and female and that many people talk to her as if they fully expect her to end up in a couple with a male at some point in the future. She noticed these things years ago and we have had to consciously teach her that not all couples are going to be male and female and that this is a good thing and that we wouldn’t be friends with the people we know and love if everyone was the same. But her reaction to the news that some people were actually *against* gay relationships was one of incredulity. I had seen that kind of surprise before. I had the privilege to teach for several years in an Integrated school here in N Ireland. For those of you not from this country you might be aware of how the Troubles here led to a segregated school system. That system remains today- most schools here are either Catholic schools or state schools (which end up being Protestant schools really). There are also a number of Integrated schools where not only are students educated together but they are also educated about being together– they learn about their own traditions and the traditions of other people. I have many stories to tell about the experiences of teaching in that environment but the one I recalled this morning, when I was thinking about the chat about Obama, took me back to a discussion I once had with a class of mine where I told them that when I was their age I didn’t know what camogie was. I didn’t know what hurling was. I didn’t realise that when some people said ‘football‘ they didn’t mean ‘soccer‘. I wasn’t able to choose to learn Irish in school or to learn Irish dancing or to play Irish music. I also didn’t know any Catholics, apart from a couple of my aunties (and one of them was English and was afraid to visit NI so I never saw her). I had no Catholic friends until I was an adult. Not one. When I told the class this they were genuinely stunned. You could see it in their faces, the, ‘How?? Why? !’ It occurred to me that my words were like another language- there was no way they could comprehend what it might have been like to simply not know someone of the other religion here. To not have anyone you could ask about their tradition. To have to rely on what your own lot told you about the other lot for (mis)information. They just didn’t get it. Part of me wanted to explain to them what it was like- how working with them had been one of the greatest revelations of my life- how they had taught me more about integration and peace and difference than I could ever teach them about Shakespeare or when to take a new paragraph. And part of me just inhaled the moment- the recognition that those dreams of the future are sometimes realised in the now. 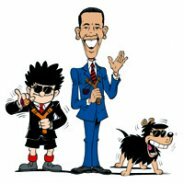 It was a bit like that last night with The Beano and my child and Obama. Some people are the revolution, even if they don’t know it. But this doesn’t happen by accident. Are you tired of people going on about LGBT equality all the time? They’re doing it so that in the future no-one has to talk about it, because it will be a given. Sometimes I get a glimpse of what that will look like, and it looks pretty flippin’ fantastic.